The University of Oregon today unveiled plans for a track and field stadium worthy of the legacies of Bill Bowerman and Phil Knight. 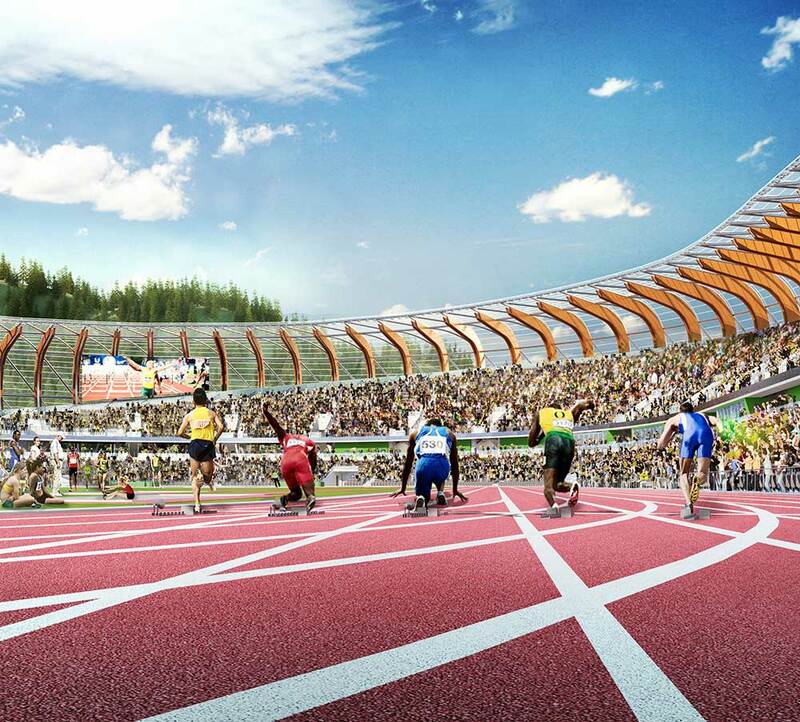 Slated to open in 2020, Hayward Field will set a new standard for sports venues, create world-class training and competition facilities for student-athletes, and incorporate new laboratories and research facilities to better understand the potential of human performance. The project is funded entirely by private donations, led by Phil and Penny Knight and including gifts from more than 50 donors. It will open the same year as the first phase of the nearby Phil and Penny Knight Campus for Accelerating Scientific Impact, a game-changing, 175,000-square-foot research complex that expands the UO’s science and innovation capabilities and is made possible by the Knights’ $500 million lead gift. 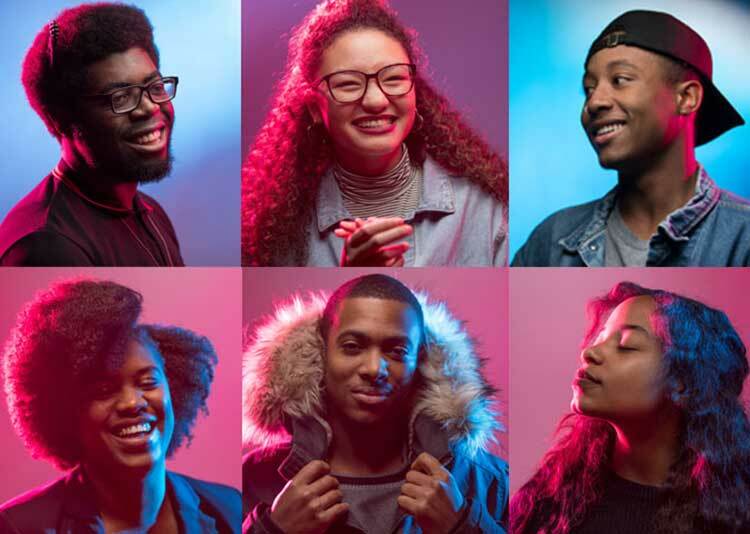 At a time when public support for higher education continues to erode nationally, the UO is redefining what’s possible for public institutions. 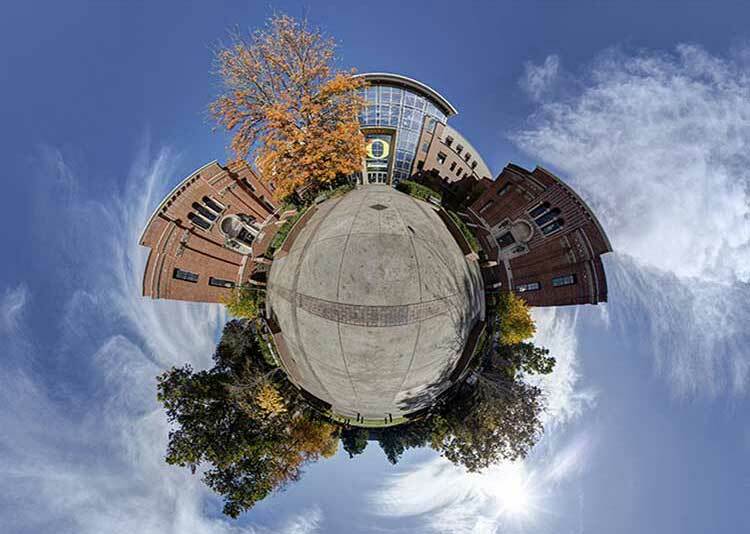 In addition to support from the Knights, the UO’s current $2 billion comprehensive campaign has received multimillion-dollar gifts from major donors for key academic priorities, and across-the-board contributions from nearly 100,000 friends and alumni. Seeds for the Hayward project began with the need to renovate a storied-but-aging facility that is the venue for an ever-growing list of the sport’s most-prominent events—the US Olympic Team Trials, World Junior Championships, NCAA Championships, and Nike Prefontaine Classic—but which lacks the infrastructure and amenities increasingly needed to host such events. Architects set out to create the ultimate fan and athlete experience: a theater for track and field. Hayward’s new stadium will visually represent Oregon, with roomy chair-back seats atop a stone base representing the majestic Cascade Range, timber beams overhead evoking Oregon’s lush fir forests, and a transparent roof providing expansive views of the emerald hills surrounding Eugene. The stadium will hold 12,500 fans—expandable to nearly 30,000 for the IAAF World Outdoor Championships in 2021. With every view unobstructed, and the front row seats virtually on top of the track, those fans will be part of the action, upholding a Hayward hallmark—the thunderous roar that spurs on the stars of track and field on to record-breaking performances. The design team initially sought to preserve Hayward Field’s landmark east grandstand. Because of numerous factors—a failing structure, noncompliance with the Americans with Disabilities Act, tight seating, obstructed sightlines, and virtually no amenities—they asked, “What would Bowerman do?” While no one can know that for sure, it was a unanimous conclusion to look to the future and take a bold, innovative approach. Plans call for elements of the grandstand to be incorporated into the new facility to preserve the rich heritage of the original stadium through stories in exhibits and graphics. Rising above the stadium will be a multi-story tower: symbolizing the Olympic torch, the tower is an ode to the man whose last act as coach was leading Team USA in the 1972 Olympic Games. Interpretive exhibits in the lobby will tell the story of a man who led his teams to four NCAA Championships; the top will offer an observation deck with panoramic views of the track, campus, and beyond. Designed to the exact specifications of world-class athletes and global competitions, from locker rooms to practice areas and athletic medicine rooms, the new Hayward Field will provide UO student-athletes with optimal facilities for training and competition, 365 days a year for generations to come. Robert Johnson, head coach of UO track and field, said that the designs point to even more success for a program steeped in excellence. Rising above the stadium will be the Oregon Tower: symbolizing the Olympic torch, the tower is an ode to the man whose last act as coach was leading Team USA in the 1972 Olympic Games. Interpretive exhibits in the lobby will tell the story of a man who led his teams to four NCAA Championships; the top will offer an observation deck with panoramic views of the track, campus, and beyond. The Bowerman, the award bestowed upon the nation’s best collegiate track and field athletes, was created in 2009. Previous winners include Galen Rupp, Ashton Eaton, Laura Roesler, Jenna Prandini, and Raevyn Rogers. 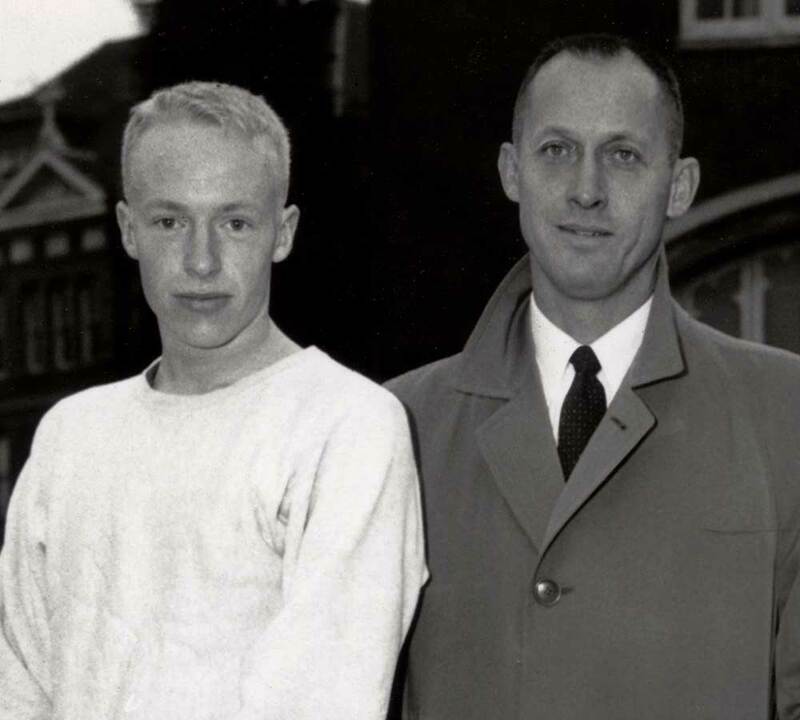 In August 1955, Philip Hampson Knight walked onto the Hayward Field oval, a skinny freshman with, as he put it, “no self-confidence, no real-world experience, and few demonstrable skills, other than the ability to run pretty fast.” By the time he graduated with a business degree, Knight had recorded 13 top-three finishes as a miler, under Bowerman’s tutelage. 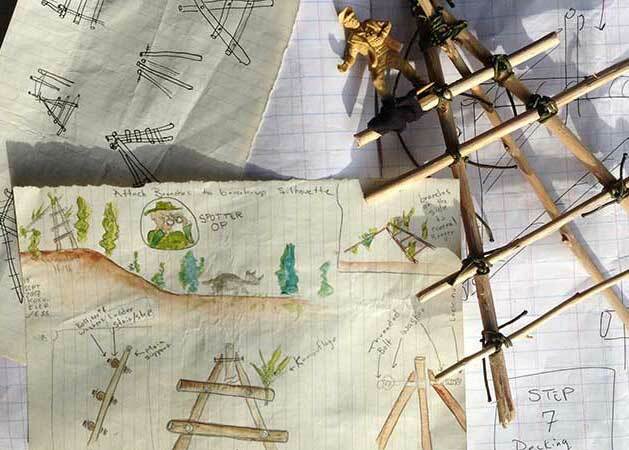 Their relationship evolved from coach and athlete into mentor and student, inventor and guinea pig, and, finally, business partners. They would cofound Nike, the world’s leading designer, marketer, and distributor of athletic footwear, apparel, and equipment. Bowerman once famously noted, “If you have a body, you’re an athlete.” Together, Knight and Bowerman helped elites and weekend warriors alike realize their athletic dreams. The Knights’ pledge to lead the reconstruction of Hayward Field is the latest act in an unprecedented track record of philanthropy to the UO and the state of Oregon. Three multimillion-dollar gifts from the family in the 1990s expanded and modernized the library, established 30 endowed chairs and professorships, and funded the construction of the law school. The Knights ensured unparalleled experiences for student-athletes by providing major support for Autzen Stadium, the Hatfield-Dowlin Complex, John E. Jaqua Academic Center for Student Athletes, Matthew Knight Arena, and Marcus Mariota Sports Performance Center. 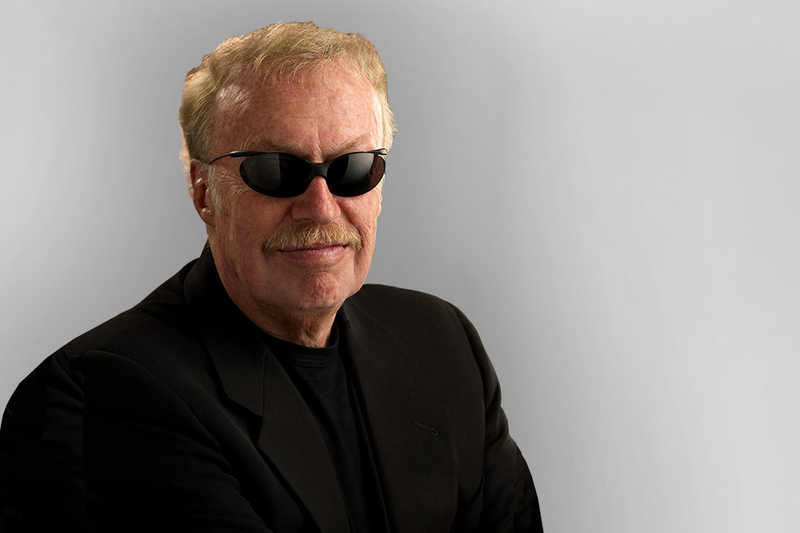 In 2016, the Knights’ commitment to academics took center stage with their lead gift for the Phil and Penny Knight Campus for Accelerating Scientific Impact, where researchers from various disciplines will strive to convert scientific discovery into societal impact faster than ever before. Hayward Field will also provide new quarters for the Bowerman Sports Science Clinic and additional classroom and lab space for the human physiology department, home to one of the UO’s fastest-growing undergraduate majors. Named for Bill Hayward, the “Grand Old Man” who coached Oregon track and field from 1904 until 1947, Hayward Field has been home to UO track and field since 1921—and the scene of some of the sport’s most memorable performances. 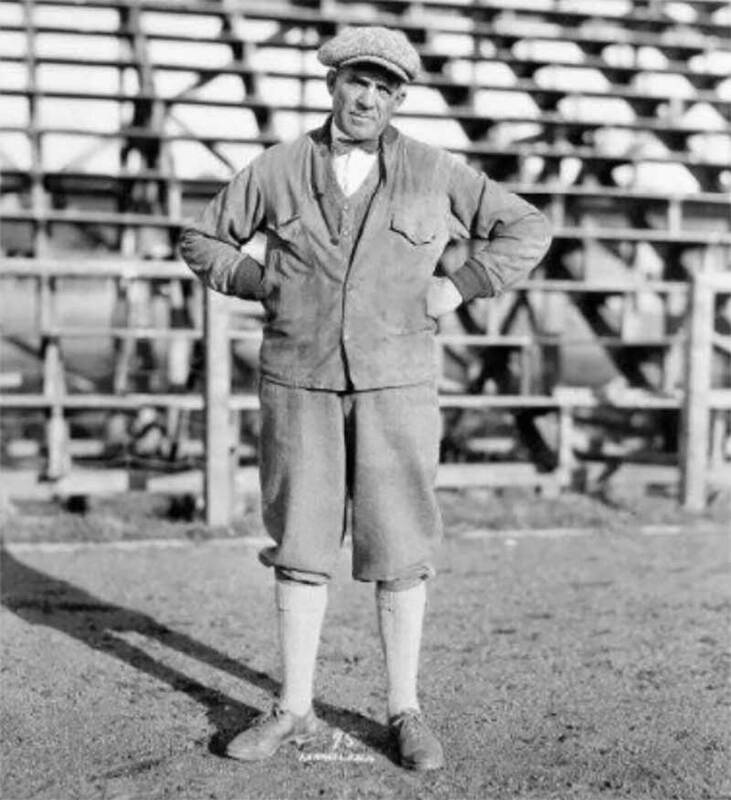 In 1924, a year before the east grandstand was built, pole vaulter Ralph Spearow, BA ’24, led the UO to its first Pacific Coast Conference title, competed in the Olympic Games, and vaulted higher than anyone in history. Fifty years later, Steve Prefontaine, BS ’74, passed Frank Shorter on the home straight to break the American three-mile record; the west grandstand the pair sprinted past on their way to the finish line was mere months from being torn down and rebuilt. In 2007, stadium lights were installed to allow the UO to host more night and televised meets; five years later, those lights shone down on Ashton Eaton, BA ’10, as he broke the decathlon world record. 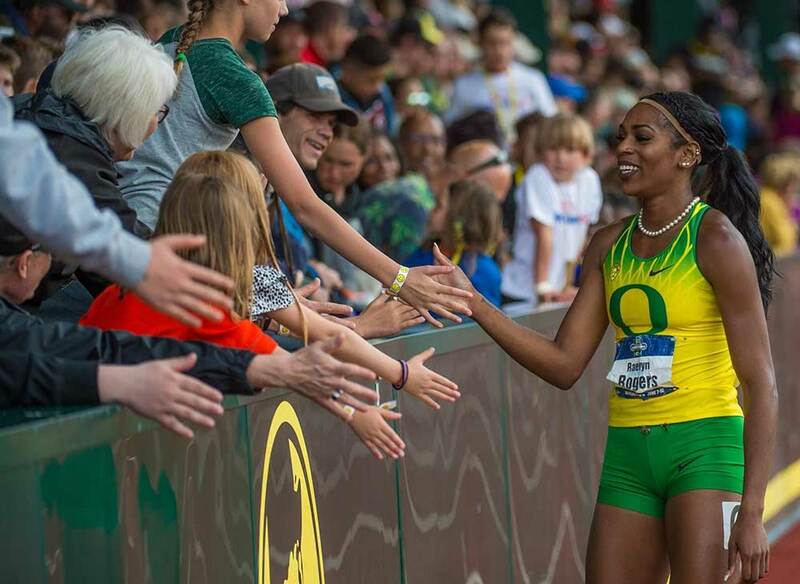 In 2017, just 12 months before the start of construction at Hayward Field, eight-time All-American Raevyn Rogers anchored the UO’s victorious 4x400 relay team at the NCAA Outdoor Track and Field Championships; the win sealed the national title for the Ducks, and they became the first women’s team in NCAA Division I history to complete the Triple Crown—cross-country, indoor, and outdoor championships in the same season. 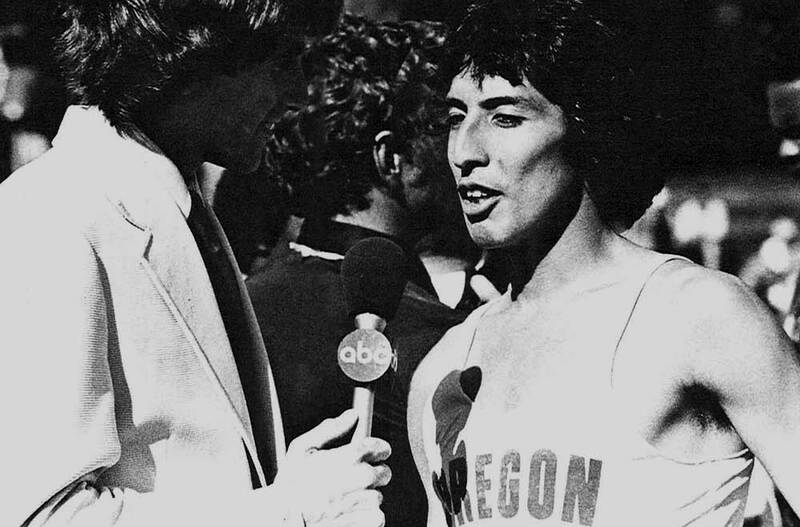 The history of Oregon track is a history of change and invention. Hayward devised knee braces and other medical equipment to aid the recovery of injured student-athletes. Bowerman launched America’s jogging boom to promote healthy living, learned how to make shoes to improve the ones his Ducks wore, and revolutionized the athletic footwear industry—famously at the expense of wife Barbara’s waffle iron. And in 2020, Hayward Field’s newest incarnation will embody Oregon’s unrelenting innovation. A century after the first bleachers rose at the corner of Agate Street and East 15th Avenue, Oregon’s track and field athletes will step onto an iconic stage to rival the world’s best. 22,944—Highest single day attendance (July 10, 2016—Olympic Trials).